BBC NEWS | South Asia | Is Bangladesh heading towards disaster? One of the world's largest democracies in the Muslim world seems to be descending into chaos, with violence, strikes, transport blockades and business instability adding to an already strong sense of tension. While Henry Kissinger was wrong to describe Bangladesh as a "basket case" in the mid-1970s - it has for the most part been more than capable of feeding itself since independence - there is nevertheless a strong feeling that the country may not escape an equally damaging epithet - that of a "failed state". Bangladesh's latest problems stem from a not unexpected but decisive announcement by the Awami League - and around 18 smaller parties allied to it - that they will boycott general elections due later this month. Fears are now growing that the future of the country and its 150 million population are now at stake. After last week's momentous boycott announcement by the Awami League leader, Sheikh Hasina, more violence and social unrest are very much on the cards. The animosity between her and the leader of the other main party, Khaleda Zia of the Bangladesh Nationalist Party (BNP), seems to be as great as ever. The two women are bitter rivals and barely speak to each other. Their mutual loathing is reflected among their respective sets of supporters. 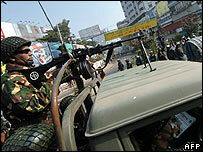 But the ceaseless bickering and violent confrontations have meant that the Bangladeshi economy - already fragile - is coming under further pressure. That is bad news when millions in the population barely earn more than $1 a day. The country is now reeling under a three-day transport blockade called by Sheikh Hasina as part of her campaign to demand a delay in the election and the removal of officials overseeing the vote who she describes as "biased". More than 40 people have been killed and hundreds more injured in political violence since a caretaker government - designated by the constitution to oversee the vote - assumed power at the end of October to steer the country through parliamentary elections. Ominously, the Awami League-led alliance has not only pledged to boycott the election but has also promised to resist the voting. If that happens, there will be a campaign of mass protests by the anti-election parties. In turn, the pro-election parties will try to gain control over the streets - and direct confrontations will be inevitable. A crucial factor in all this is the role of the law-enforcement agencies - controlled by the caretaker government - and their ability to curb any violence. Despite the boycott decision, the caretaker government says that it is determined to organise the election on time. But analysts fear that the result might not be accepted nationally and internationally, and the country would be plunged into anarchy. The Awami League-led alliance says that conditions for free and fair elections are not in place and the vote should be delayed. They say that President Iajuddin Ahmed - in charge of the caretaker administration - should step down and an up-to-date voter list be published. "There is major legitimate concern about the process leading up to a free and fair election," said analyst Debapriya Bhattacharya, the executive director of the Centre for Policy Dialogue think-tank. The most-debated issue now is whether there is any "constitutional flexibility" which can be invoked in order to allow more time to accommodate the Awami League demands. But the BNP of former Prime Minister Khaleda Zia is not interested in that. Dr Bhattacharya argues that such a stand-off is going to have a serious impact on the overall development prospects of the country as well as further complicate Bangladesh's "image crisis". "One possibility is that with rough and tough measures the caretaker government pushes through with the election, which of course eventually will not be credible because so few candidates are participating," he said. The other possibility is that the opposition campaign stimulates so much pressure that the country becomes paralysed, forcing the caretaker government to reconsider the election schedule and carry out electoral reforms before announcing a new vote schedule. If there is a complete breakdown of law and order, Dr Bhattacharya said that martial law is not beyond the realms of possibility. "But whatever may be the options, each party will always look for constitutional cover so that they can somehow have a legitimate basis for their action," he said. 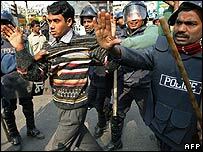 Many Bangladeshis are now doubtful about the future of democracy in the country. 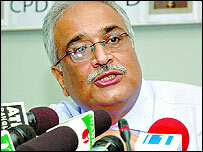 The BNP has already warned that the Awami League alliance will be responsible if democracy is endangered. Analysts say the two main parties must come to some kind of agreement if disaster is to be averted. "If Bangladesh wants to maintain its development prospects and democratic credentials, it will have to have a credible election held in a free and fair way," Dr Bhattacharya said. For Bangladesh - with 40% of the population living below the poverty line - democracy and development are interlinked, he said. "If the country does not improve its governance through better democratic practices, it will not have good development, and without that, it is not going to sustain its democracy." Bangladesh's political history has always been turbulent. Just how turbulent now depends on the Awami league and BNP leaders.